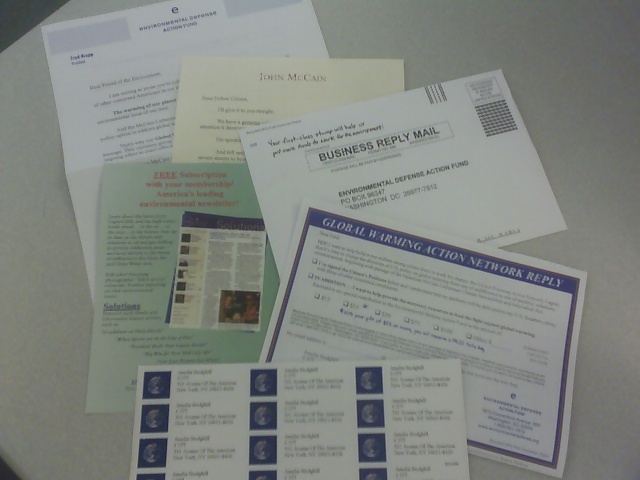 I hate mass mailings, junk mail, direct ads - all that crap that comes in my mailbox which adds up to a bunch of wasted paper and goes directly into the recycle bin. I usually hand my junk mail to the clerks at my mailbox place, but the whole global warming thing peaked my interest. On the back of the envelope is the sender: Environmental Defense Action Fund. I suppose there are worse mailing lists my name could be sold to. 2) A two page double sided letter from Fred Krupp, president of Environmental Defense Action Fund. This one asks "Friend of the Environment" to join the Global Warming Action Network (again, in bold type). It talks about polar bears and ice caps, then touts some of Environmental Defense's accomplishments, and reiterates much of what McCain's heartfelt letter already said, including the market based approach of the McCain Lieberman Climate Stewardship and Innovation Act. Then it tells me I can support by signing the enclosed petition, and encourages me to make a contribution. 4) Sticky return address labels with my name and address on it! Cool. 6) A three-fold petition/contribution form. You can check a box to say you've signed the below petition, check a box to say you want to contribute, plus you can even check a box to opt out of receiving the free tote bag. While I appreciate their efforts, and really hope these mailings get them some cash, I'll stick to petitioning my senators via e-mail through venues such as Environmental Action. Does this mean I'm not doing my part? Maybe - but form letters, tote bags, and address labels don't really move me to action - it really just makes me want to remove my self from their mailing list. Thanks for the warm wishes, by the way. Yah - I have pretty mixed emotions about direct mail - on one hand I totally get it (as in understand, not receive), on the other it's SOOOOO annoying sometimes. At any rate, I'm a little suspicious of what you're describing. First of all, I don't really think of either McCain or Lieberman as 'friends of the environment' - secondly, whenever I hear 'market-based solutions to ecological problems' I think of Reagan, and go fetal. At the same time EDAF seems to be a wing of Environmental Defense, which is in and of itself a pretty good group, I believe. Anyhoo - my two cents - hope you're doing well! Question: Who is "The Environmental Defense Action Fund?" The flyer doesn't really say. The signatory is Fred Krupp, who is president of Environmental Defense, but if so, what is the "Action Fund." This sounds like stealth McCain to me. fyi I just got another one of these packets in the mail the other day. although i didn't open it to find out if the same stuff was inside, but same envelope, same message, same recycling bin.... 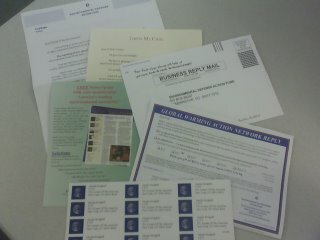 I don't care who the organization is, direct mail does not work on me. I will never be want of return-address labels. I wish the money was being put to better use, though.